Expanded Polystyrene (EPS) commonly known as Styrofoam TM (trademark of Dow Chemical) is found almost everywhere in our daily lives. It is used for everything from coffee cups to home insulation because of its light weight and high insulation value. EPS often gets a bad rap from environmentalists but did you know that it is a high value recyclable material? Bright Technologies EPS Densifiers are heavy duty "Professional Grade" machines. The equipment is designed and manufactured in the United States. 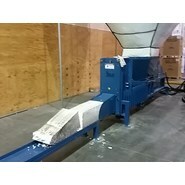 The EPS Densifier can be paired up with a pre-breaker and conveyor to create turnkey process to break up your EPS and process the material through the Sebright Densifier.